This handsome little modern building sits not far from the busy Ipswich to Manningtree road, down a little lane. Built in about 1960 I should think, it is very purposeful and pleasing, in the way that small scale architecture of that period can be when it is found in a chapel, a school, a library, or a clinic. It reminded me of the work of the Ipswich-based architectural partnership Johns, Slater Haward at that time. The notices in the window suggested that this is a busy place, too. 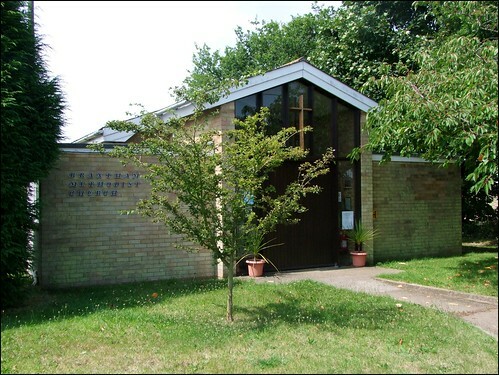 Methodism came to Brantham early, the Wesleyan Society in the village forming in 1799. It can never have been a big society, though. At the time of the 1851 census of religious worship, the society did not have a chapel of its own, meeting in a room set apart for the purpose which is part of a dwelling house, let by the owner at a nominal rent. This is probably the Wesleyan house registered in 1828. On the evening of the census they had a congregation of thirty people, fairly small in comparison with Methodist chapels elsewhere; but in the last few miles I had cycled past two large closed Methodist churches, one from the 19th century and one from the early 20th, both now converted into houses, and so it was nice to find that this one was still in use. I fear that Methodism is now passing from us as a distinct denomination, and so I was pleased to discover that it was still hanging on in Brantham. And, unusually for a Suffolk village, Brantham has an Anglican church, a Catholic church and a Methodist church. Long may they all prosper.